“All forward” our guide yelled out. Right on cue, everyone in our boat began to paddle as we blasted through our first set of rapids. 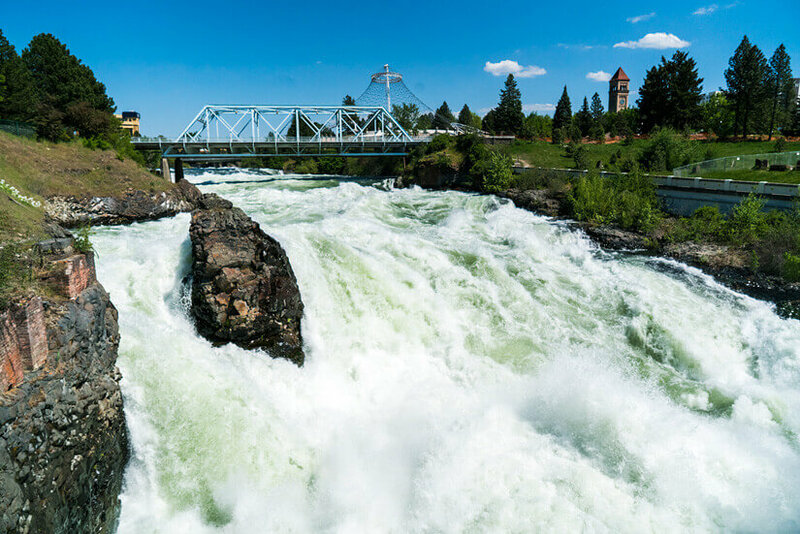 We were white water rafting in Spokane, Washington, with Wiley E. Waters and it sure was an exciting way to start our morning. We booked the Lower Spokane White Water trip. Our departure point for our adventure was right outside of the heart of downtown Spokane—how cool is that?! 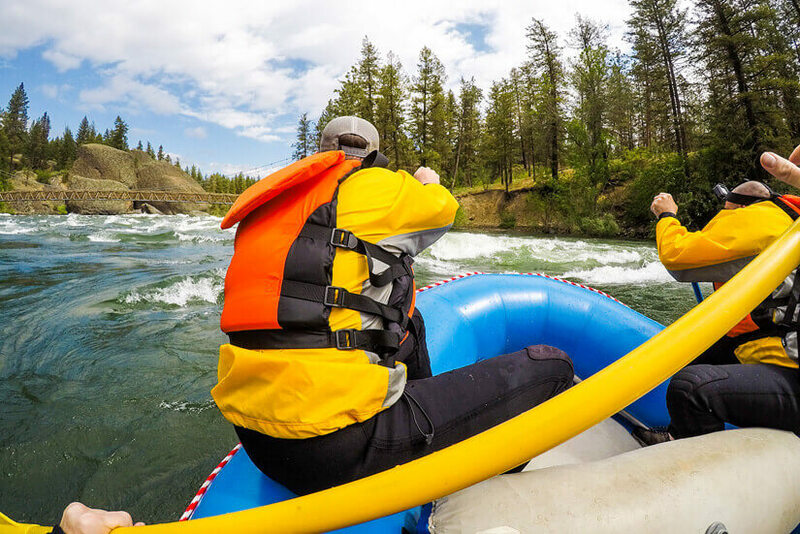 There aren’t too many cities where you can depart on a white water rafting trip right in the city, and we were starting our adventure less than a mile downriver from the roaring Spokane Falls. We pulled up to the meeting point given to us by Wiley E. Waters and parked our car on a quiet residential street next to the river. There isn’t an office located at the launch point, so we waited a couple of minutes and soon spotted our guide as he pulled up to the launch point with the raft. Since it was early summer, the water was still pretty chilly, so we suited up with wetsuits, life jackets and paddles. We were given a briefing on what to expect on the water and then it was time to jump in the raft! Our group was small—it consisted of us, one other guest, and our guide. The beginning portion of the trip was peaceful and relaxing. We soaked up the sun and watched the beautiful scenery pass us by as we floated down the river. Along the way, we went around “The Big Bend” on the river, and we spotted several deer, plenty of pretty riverside houses, a disc golf course, parks, bridges, rocky cliffs, and forests. One of the rapids we rode was the Bowl and Pitcher, a Class III rapid in Riverside State Park, which is also where we went hiking later in the afternoon. This area is made up of lava rock that was eroded by the water and it now looks like a pitcher that’s about to pour. We rotated spots in the raft a couple of times to get a feel for the different positions in the boat, but in the end, none of us escaped without getting soaked. After making our way through the rapids, we had more time to float peacefully down the river. If you wanted, you could jump in the water at this point—Micah and I were too chilly to go for a swim, which was quite funny as our guide was only wearing shorts and a t-shirt and we were in thick wetsuits. I guess we might not have been thawed out from the long winter we had last year! The take out point for our trip was Plese Flats. All in all, the ride down the river takes between 2-3 hours in total. The Lower Spokane River rafting trip is suitable for both beginner and intermediate paddlers. After pulling ourselves and the raft out of the water, we had a short 15-minute ride in the van back to our car at the starting point. Our morning out on the river was a blast and white water rafting in Spokane was definitely a trip for the books! I love rafting, and I’m really impressed by your photos! My rafting photos have always turned out less than mediocre, but it’s fun to have the memories regardless. I’ll be up in Washington this weekend (though not Spokane) and am really looking forward to enjoying the nature! Thanks so much, Kirstie! But, totally agree–always fun to have the memories regardless! 🙂 Hope you have a fun time in Washington–such a great place to get out an enjoy nature!